Welcome to the WBMA-TV website. Here you will find information about WBMA-TV, our programming schedule, bulletin boards, purchase programs, watch a streaming live version of the station, view past and current programs on demand via the web and much more. Visit our forum section to discuss your favorite programs, learn the latest about the station or even how to become a WBMA-TV volunteer. Please check back on a regular basis as our programming schedule changes weekly and new programs and community messages are added all the time. 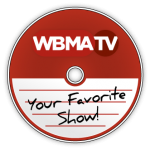 Sit back, relax, and watch WBMA-TV live from any computer. If you would like to view any of our archived programming, please visit our Media Center page.